And as you can see, the U.S. government told the Washington Post what to print and what not. Another important & transparent leak you can believe in. What real NSA whistleblower would trust the Washington Post anyway??? The latest published leak from NSA whistleblower Edward Snowden lays bare classified details of the U.S. government’s $52.6 billion intelligence budget, and makes the first reference in any of the Snowden documents to a “groundbreaking” U.S. encryption-breaking effort targeted squarely at internet traffic. Snowden, currently living in Russia under a one-year grant of asylum, passed The Washington Post the 178-page intelligence community budget request for fiscal year 2013. Among the surprises reported by Post writers Barton Gellman and Greg Miller is that the CIA receives more money than the NSA: $14.7 billion for the CIA, versus $10.8 billion for the NSA. Until this morning it’s generally been believed that the geeky NSA, with its basements full of supercomputers, dwarfed its human-oriented counterparts. The Post published only 43 pages from the document, consisting of charts, tables and a 5-page summary written by Director of National Intelligence James Clapper. The Post said it withheld the rest, and kept some information out of its reporting, in consultation with the Obama administration to protect U.S. intelligence sources and methods. One of those methods, though, is hinted at in the Clapper summary — and it’s interesting. Clapper briefly notes some programs the intelligence agencies are closing or scaling back, as well as those they’re pouring additional funds into. Overhead imagery captured by spy satellites was slated for reduction, for example, while SIGINT, the electronic spying that’s been the focus of the Snowden leaks, got a fresh infusion. The Post’s article doesn’t detail the “groundbreaking cryptanalytic capabilities” Clapper mentions, and there’s no elaboration in the portion of the document published by the paper. 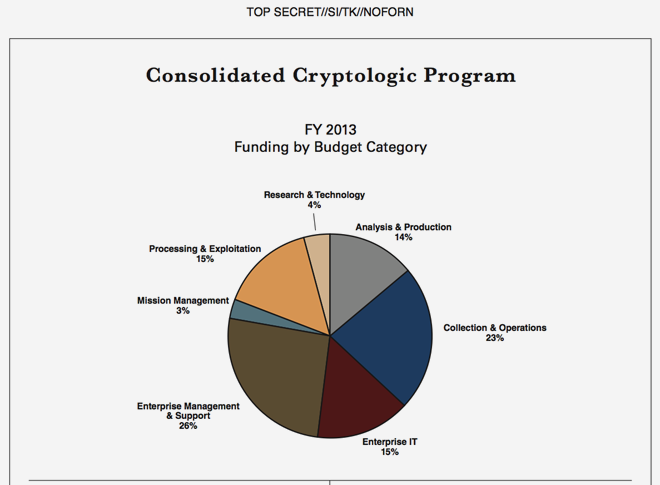 But the document shows that 21 percent of the intelligence budget — around $11 billion — is dedicated to the Consolidated Cryptologic Program that staffs 35,000 employees in the NSA and the armed forces. In a WIRED story in March of last year — the pre-Snowden era of NSA reporting — James Bamford reported that the NSA secretly made some sort of “enormous breakthrough” in cryptanalysis several years earlier. Previous Snowden leaks have documented the NSA and British intelligence’s sniffing of raw internet traffic. But information on the NSA’s efforts to crack the encrypted portion of that traffic — which would include much of the email transiting the net — has remained absent; conspicuously so, given the NSA’s history as world-class codebreakers. The leaked budget document is the first published Snowden leak to touch upon the question of how safe routinely encrypted traffic is from cutting-edge nation-state spying. The Post is silent on when Snowden leaked the black budget. As a condition of his asylum, Snowden agreed not to release any more U.S. documents while in Russia. But he may well have passed the budget to the paper in May at the same time that he turned over documents on the NSA’s PRISM program.